"Atarihave re-established their name as quality game designers with this beautiful jetski racer." Splashdownis one of those games that will make you sit up and take notice. Gran Turismo 3did it on the tarmac, Final Fantasy X does it for role playing games, whileSplashdown shows all comers how to get water effects right. Andwhen we say all comers we mean it. 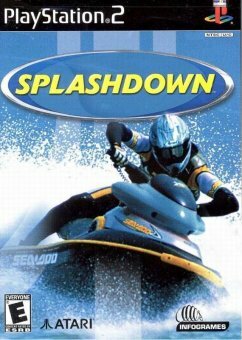 We were fortunate enough to play Splashdownover the same timeframe as the just-released Jet Ski Riders for PS2, and WaveRace for Game Cube and we have to admit that Splashdown is definitely the betterin terms of graphics, and in some ways edges the other 2 out in the gameplaystakes too. Let�slook at it in a little more detail. Splashdown was developed by Atari/RainbowStudios and features the standard single- and two-player modes of circuitracing. 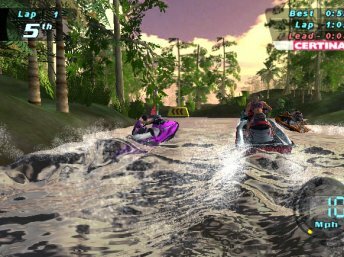 Both modes allow you to race in a line-up of 5 racers, and the frameratedoesn�t change even when the screen is full of motion. Inaddition to circuit racing, there�s Free Ride (allowing you to just enjoy thescenery), Time Trials and two special modes Countdown and Copycat. This lastmode is for two-player action only where the players take turns trying to copyeach other�s manoeuvres. You initially start out with access to only several circuits, but as you progress through the Career mode in single player, you�ll open up the remainingcircuits, for a total of 21. I don�t normally like having more than half agame locked away but in this case it was a joy each time a new track wasenabled. Fourof the racers are immediately accessible, with 4 more human racers added to yourchoice as the game goes on. I say human, because once you�ve completedeverything, you�ll open up one final racer, simply named Steve � and he�sdefinitely not human � I�ll let you find out what he is. Each racer has upto 8 wetsuits to choose from, and although this is really just eye candy, itshows that the developers didn�t do a half-job. Thecircuits are varied in both location and style. From Hawaiian islands and foggy lake shores to river tracks and man-made pool circuits, each of thecircuits provides a different racing experience. The last few are especiallyunique, with the Amazon River needing to be negotiated in the dark, Bering Straight with ice floes, cruiseships and icy water and, finally, Bermuda Triangle � which turned out to be ahodge-podge of wrecked ships, submarines and spaceships negotiated under apurple-pink sky. Control-wise,the game is very clever. Much like the Sea Doo�s the game is modelled on,steering your craft is performed by leaning to the sides, or forward orbackward. Shifting your weight in this way causes the rider to lean and the jetski to move in that direction. However,the best method of steering is to combine several directions. So to perform atighter corner, not only push to the side, but dig the nose of the jet ski intothe water. To go faster, pull back on the thumbstick to bring the front of theSea Doo out of the water � this allows it to hydroplane more effectively. Infact, using these techniques, you can submarine entirely underneath the water(and some obstacles), or cause the jet ski to bunny hop over small barriers.This can be further extended by doing complete somersaults, or a myriad oftricks when in midair by hitting the appropriate combination of buttons. Thesound effects are nice but not outstanding. The music can get a littlerepetitive and there are a couple of stuttering issues, particularly noticeablein the intro FMV sequence. Andfinally, we get to the graphics. This review is definitely a case of saving thebest until last. Sure, the racers themselves are low-textured, and have alow-number of polygons. And yes, the backgrounds and surrounding scenery couldhave been worked on a little more. However,the water effects far, FAR outweigh any other aspect of this title. In fact, thewater is done so well in this game, that most of the time for your first fewdays of playing you�ll be constantly distracted by the waves and splashes.I�ve been playing games for almost 20 years, and I never thought I�d seewater like this. Justlike real water, the water in Splashdown is constantly moving and reflecting thelight sources in all different directions. Small ripples and wavelets areever-present, and as the riders move through the water, their trails interminglewith existing water motion and cause different effects to be seen. Thecolouring of the water is affected by the depth and by the type of bottomsurface. So, the man-made pool circuits in Seoul and Madrid are the bright blue you�d expect, while the Great Barrier Reef stage is that turquoise that makes the Reef such a special place. The lake andriver circuits are appropriately darker, and the night stage on the Amazon River is simply indescribable in how good it looks. Somestages have sections in the open sea or along the shore, and larger waves arepresent here. Hit them at the right point and sail across the next 1 or 2 waves,hit them at the wrong point and bury yourself under 6 feet of water. Ifyou haven�t seen this game yet, you�re seriously missing out on one of thosemagical moments in gaming. Rent it if you must, but make sure you at least seeit in action. Screenshots and downloadable movies just don�t give it justice.